Whether Apple’s App Store or Google’s Play Store has the best selection of apps, it is still up for debate, but we are fairly confident in stating one thing: Android users have, without a doubt, access to the most crazy and indeed often least useful, selection of apps! Now don’t get us wrong, we like a little bit of the ‘odd’ as much as anyone else, and that’s why we instantly fell in love with this little app from developer Ages Games. Despite the developer’s name, this app is not actually a game. In fact, we’d probably call it more of a simulator than anything else. Yes, in fact that’s what we’ll call it; a simulator. But what does it simulate, I hear you cry? Only the coolest watch of most of our childhoods. The Casio digital watch! Well, it does, and it doesn’t. See, Watch Beep actually simulates the most iconic part of the 1990s watch – little hourly beep that used to signal we were one step closer to going home from school. Oh how we loved that beep. Now we can’t be the only ones that feel more than a tad nostalgic for those old Casio watches, which is why we think this app may be more popular than you would honestly imagine. 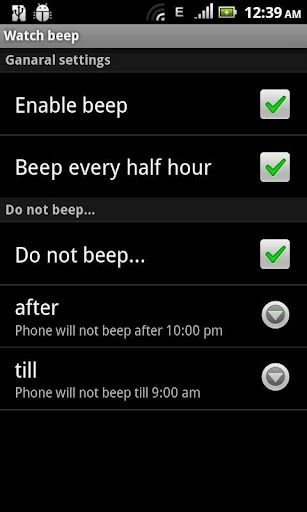 Priced just right at the bargain-ous free, Watch Beep isn’t exactly filled with options, but the most important one is there – you can set a time period during which the phone will not make any noises. No beeps while you’re asleep, for example. Brilliant! Even our watches didn’t do that! The developer claims that the app will not drain your battery, though we have yet to test this theory out ourselves. That said, we can’t imagine much being done in the background, and with the developer saying that he uses the System Alarm Service, we’re going to go ahead and believe his claims. If he’s wrong, do let us know! If you’re of the right kind of age to remember the Casio watches we all grew up with, then the chances are; you’ll have a yearning to at least giving this little app a try. It’s not going to cost you any money, so what’s the worst that could happen? And there’s always the chance that it’ll be absolutely awesome!